How many of us have purchased an accessory for our kayak only to learn or discover another accessory that would have been a better option? All too often this occurs, and more commonly, it happens after you have made permanent modifications or holes in your kayak's hull.........arggghhhhh!!! Recently, YakAttack released an innovative product called GearTrac that will completely revolutionize the rigging options for kayak owners and hopefully help many like myself avoid this situation. The concept is simplistic in nature but flawless in design and execution. 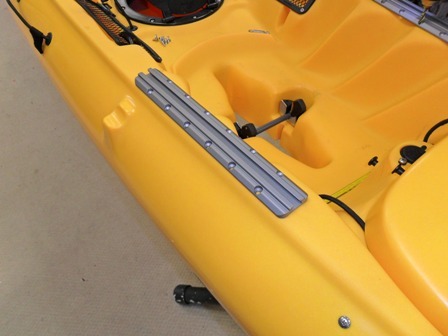 No longer is a kayak owner limited in the accessories that they can install on their kayak. 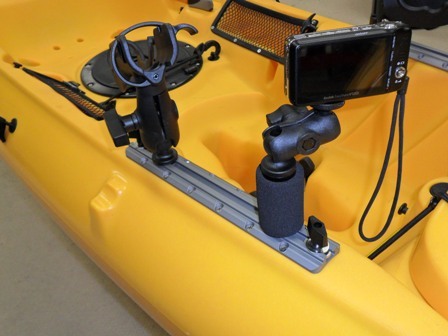 From rod holders by RAM, Cannon and Scotty to camera mounts for your Scientific American, GoPro, Kodak or other video/filming cameras - the GearTrac has you covered. Each GearTrac kit comes with the length and quantity you ordered and the requisite installation hardware and drill bit. It comes in varying lengths of 4", 8", 12" and 16" at this point in time, and currently, HOOK1 is an authorized seller of the GearTrac, so head on over there and order your own lengths of GearTrac to get started. My first modification was actually an original concept recently thought up by my good kayak angling friend Rob Choi. The premise behind the custom bracket is to utilize the milk crate itself as the primary reinforcement and support for the custom bracket where the GearTrac is installed. 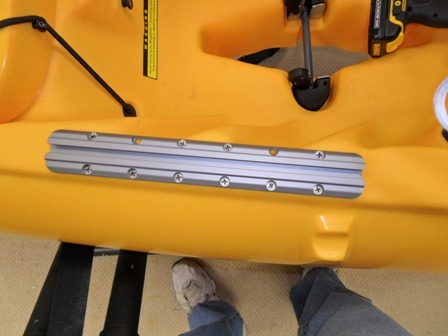 After consulting with Luther Cifers, we devised one small modification to the first version of the bracket designed for Rob - we added two notches on the leading edge to allow for utilizing the tank well bungees found on most kayaks. Once completely installed, there are seven stainless steel screws that attach the custom bracket to the milk crate, then the 12 stainless steel screws that attach the 12" section of GearTrac to the custom bracket. Once installed completely, the bracket and GearTrac are very secure and only move when the crate itself is jostled or moved. Very stable. For those that know me, you know I don't like a cluttered kayak foot well and cockpit area, so the next step was figuring out where to install GearTrac in the front of the Hobie Revolution 13. The challenge that we faced was how to ensure sufficient attachment to the kayak to minimize or prevent movement of the GearTrac and maintain a usable and clean installation. On several Hobie models, as well as several major kayak manufacturers like Ocean Kayak and Perception Sport, there are scalloped foot wells that may limit where you could traditionally install accessories like rod holders or camera mounts. 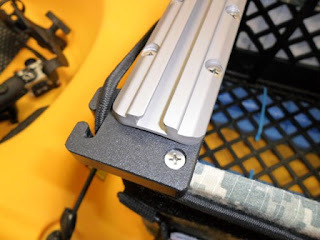 Most notably on the Revolution and Adventure line of Hobies, the gunnels are narrower than most kayaks even when compared to Hobie's own Outbacks, so the location of the GearTrac mounting holes had to be planned carefully to ensure a stable mounting location. For me, the GearTrac was lined up to ensure the middle set of mounting holes and the end mounting holes would be the primary attach points. Before we go any further, a note of caution is needed here. While a drill is needed to make the pilot holes utilizing the accompanying bit in the kit, it is not recommended that you utilize the drill for installation of the mounting hardware. Doing so could result in a stripped out hole and compromise the integrity of the GearTrac's stability. Once the location was verified, one pilot hole was drilled and then secured using a screwdriver to hand tighten using the included hardware. The GearTrac was then re-aligned and checked once more before making a second pilot hole at the opposite end of the GearTrac. Once that end was secured, the remaining pilot holes can be drilled and secured with the remaining hardware. The included drill bit is designed to provide a smaller diameter pilot hole than the size of the included stainless steel screws. 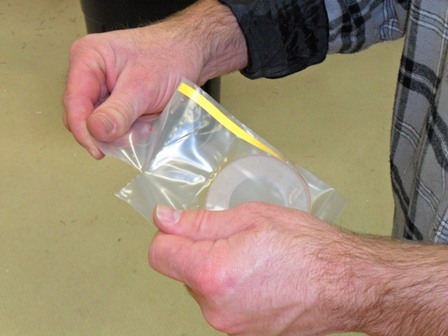 This ensures a watertight seal at each attachment point. You'll notice that two of the twelve holes were unable to be utilized due to the scalloped foot well area; however, the GearTrac does not move once installed utilizing the placement above. The paddle rest was utilized as the initial reference point, then the placement was adjusted to take advantage of the center most mounting screws and the end ones as well. A final measurement was made to a different reference point to ensure the installation was symmetrical on both sides, and the GearTracs were installed. Now, the fun begins - configuring your respective GearTracs to accommodate your fishing style. For me, simplicity is the key. My specific needs were: a place to stow a rod during the landing of a fish. Anyone who has fished out of a kayak knows what limitations there are in the cockpit area of a kayak. I opted for two RAM Revolution 2007 rod holders with the YakAttack 1.5" Screwball w/ a Mighty Bolt base. The next item I needed was a 1" Screwball w/ a Mighty Bolt base for use with my existing RAM Fishfinder mount, and a Panfish Portrait w/ Mighty Bolt base for a camera mount up front for those planned hero/glory photos of all the trophy fish I plan on catching (let me know when you have pulled yourself off of the floor from your laughing spell). The last item was actually a recommendation from YakAttack himself - the prototype securing bolts as a means of providing redundancy for securing any of your accessories mounted on the GearTrac. A small price to pay to ensure the security of such accessories like your camera or that custom rod and reel combo from taking a trip to Davey Jones' locker. When you plan your next modification to your kayak, I highly recommend you consider the GearTrac option. It provides you greater flexibility in how you outfit your own respective kayak, and more importantly, provides you greater flexibility while on the water to maneuver rod holders out of your way or to position them for trolling or live lining bait on either side of your kayak. The ways in which you can utilize the GearTrac system is only limited by your own ingenuity and imagination. Other kayak anglers are catching the bug, why don't you? Oh, and did I fail to mention one more small point of note - all YakAttack products are sourced and produced by local companies. This is a huge selling point from the perspective of supporting your local economy and small business owners. Mad props to Luther for doing this. 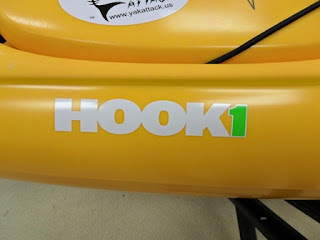 Thanks again for a quality engineered product that is geared to those of us in the sport of kayaking and kayak angling. For other tips on YakAttack products, as well as discussions on general kayak rigging, check out the YakAttack Tech Support Forums. Tight lines folks and remember - measure twice, drill once!! On most kayak forums, one could search the archives and current topics and almost be guaranteed to find a thread or two on kayak visibility at night and the opinions/recommendations for how to make your kayak more visible. Some people recommend lighting as your primary visibility markers for safety, while others recommend reflective material from piping on your PFD to reflective tape of some type. 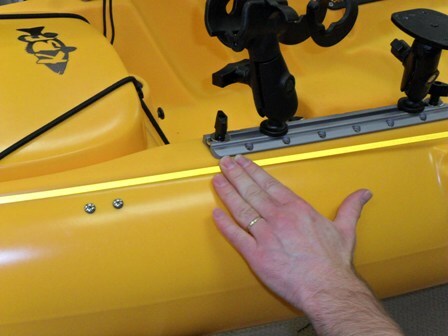 YakAttack has recently released the NITEStripe kit to help compliment a kayak's visibility profile under low light conditions. The kit comes in a variety of colors (red, blue, green, white, orange and yellow) and includes installation tips on the package label, a 24' length of NITEStripe and a perforated package that permits dispensing of the NITEStripe without it coming unwound at your feet. Step 1 (Preparation) - cleansing the kayak surface with rubbing alcohol and visualizing the layout. 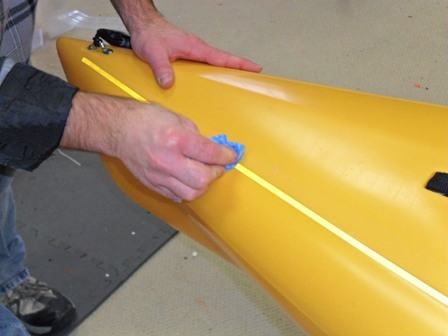 Step 2 (Positioning) - gently place the stripe on the kayak in your desired locations. Step 3 (Adhesion) - stripe adhesion occurs from applying pressure. 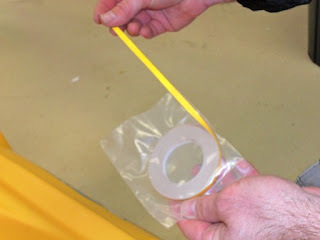 Step 4 (Finalization) - remove the clear protective film from the top of the stripe to complete the install. Now that is an over simplification of the installation process, but you get the drift. To install the kit, you must first use rubbing alcohol and prep the kayak surface for the NITEStripe. A word of caution here - do not use any oil-based cleaning agent to remove any previous decal or sticker residue. 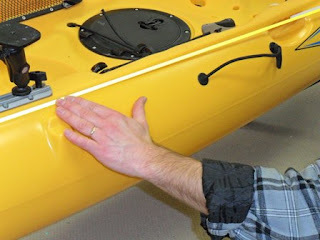 It prevents the NITEStripe from adhering to the kayak properly and will result in a stripe that eventually comes off. Once you have prepped the kayak surface using the alcohol, begin by peeling back an inch or two of the backing and gently placing the end of the stripe at your desired starting point. Unwind approximately 18-20" of the stripe, removing the backing and place the stripe where you want it. A piece of advice here - avoid placing the stripe in small sections of 2-3" at a time. You will end up with a line that is not straight and will require you to reposition the stripe repetitively. Remember, when installing the stripe to not press the stripe into place firmly yet. Only after your are certain that the stripe is placed correctly do you move on to the third step of the process. 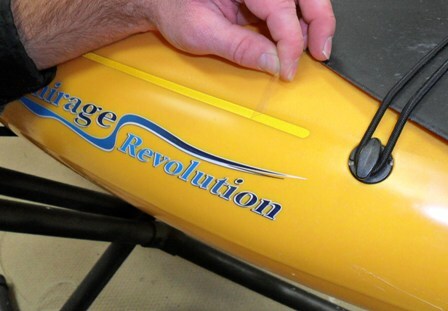 Once you are comfortable with the placement, apply pressure at the starting point of the stripe using a cloth of some form and run the entire length of the strip using consistent pressure to activate the adhesive properties of the stripe to the kayak. Now you are ready for the final step of the process - removing the protective film. If you forget this step of the process, you will find your stripe will appear to crack or ripple over time. This is not an indication that the NITEStripe is defective - it only means you forgot to remove the protective layer of film from the stripe. To do this, use the edge of a razor blade, utility knife or some other fine point like a needle or even a fish hook (you have some of those right.....) and gently remove the leading edge of the protective film at the end of the installed stripe. Once you get it started, you can remove it fairly easily. In my opinion, the kit is simple to install - all it requires is a little preparation, some preliminary design and layout considerations, a keen eye and a little patience. The total prep and installation time for this was 15 minutes. The end result.........increased visibility at night or under reflective light conditions. I hope you found this tutorial helpful. While kayakers cannot anticipate the actions of others on the water, we can do our part by increasing the likelihood that another vessel on the water will be able to see us. It is our responsibility as kayakers to not rely upon just a light to provide some measure of safety while on the water. Take the time and assess your own respective visibility profile at night and ask yourself the question - can I be seen under low light conditions? 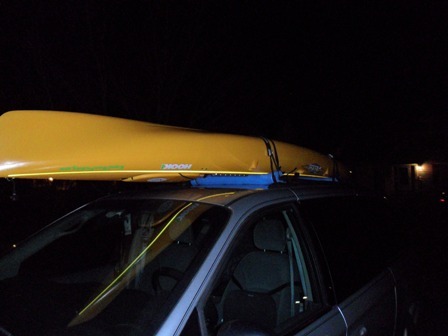 I know my kayak can now thanks to the addition of the NITEStripe kit. I know it will help me when combined with my YakAttack VisiCarbon Pro light, my headlamp and the reflective piping on my PFD. To purchase your own NITEStripe kit, head on over to HOOK1 or stop by your local kayak shop, like Appomattox River Company and ask for it by name. For other tips on YakAttack products, as well as discussions on general kayak rigging, check out the YakAttack Tech Support Forums. That's review and recon/research folks.........I wish it was rest and relaxation. The winter of 2011/2012 has yet to rear it's ugly head here on the peninsula in Virginia, although days of high winds and low temps are starting to increase in frequency of late. Many kayak anglers have taken advantage of this time to get out almost daily to chase after the various species that can still be found in the bay area. For myself, this time of year is hit or miss logistically due to work, family events and wind conditions. On Wednesday February 1st, the air temps were forecast to be in the low 70's with winds in the 10-15mph class. A perfect opportunity to get out on the water for some long overdue recon and testing of potential tackle setups for the coming year. I recently purchased a few items I had been wanting for some time: an Abu Garcia Revo Inshore baitcaster paired with a Shimano Teramar Inshore SE Series rod; an Okuma EVx 6'6" MHF casting rod paired to my existing Abu Garcia Revo S; and a Shimano Calcutta 200B paired with my existing St. Croix Mojo Bass Spinnerbait model rod. I also was yearning for some time on the water to test out my recent flush mount modification and to try some different Marsh Works Bayou Thumper and hair jig combos. As you can see, I had a few things lined up to keep me occupied on the water, and to be quite honest........fishing really wasn't the goal for the day. GASP!!! Hard to believe I know!! First order of business - the YakAttack VisiCarbon Pro and the new Scotty 444 Compact Flush Mount install from two weeks ago worked flawlessly. I installed the VisiCarbon Pro along with my other gear and off I went peddling about the Willoughby Spit shoals and rip line. This area can get pretty nasty in high winds and seas, but fortunately, the waves were slow rollers and handled easily by the Hobie Revolution 13 even in the steady winds. Winds were blowing straight out of the west down the main river channel across the tunnel passage, but I avoided that area and stuck to the inner portion of the rip line and rock jetty. I pedaled about for close to 2 hours before taking a quick break to change out some of the lures on my setups and snap off a few photos. Now I did technically "fish", although I knew I was not likely to catch anything having launched into the tail end of the ebb tide window. 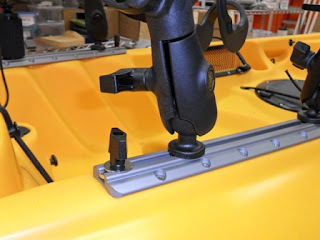 As you can see by the picture above, the VisiCarbon Pro is installed aft of the crate and rod holder storage unit and was not at risk of getting snagged by any treble hooks or other items on the kayak. Some would question the location as a risk for a snag or getting hit on a back cast, but for me I am typically casting no more than 20 yards at any given moment and that I can accomplish with a simple side cast or shortened overhead casting motion. Now, if I end up using my 10' fly rod in this kayak in the future, I may have to use a higher back cast or sidearm roll cast technique, but I am installing a secondary mount location in the next few weeks to address this particular problem. For now, the placement of the flag is optimal for my fishing techniques. On to the next task - equipment testing. For those that read my blogs, you probably recalled that the Revo Inshore/Teramar combo was used rather extensively a few weeks ago on my epic night of 40 fish. However, I wanted to test out the setup again in higher winds throwing lighter presentations. The lure of choice tonight was a prototype Marsh Works skirted jig paired with a Killa Squilla. The jig itself I was testing was extremely lightweight, most likely 3/16oz. but when paired with the Killa Squilla resulted in a nice 3/8oz. combo. I was able to cast this combo easily into the wind a good 20 yards, but the current was not allowing the bait to get low enough in the water column for it to be effective. In the future, I think I will opt for a heavier plastic body or see if there is a heavier version of the skirted jig. I can see this lure combo being very effective on the saltwater flats for tailing Redfish or even as a freshwater bass lure. I plan on testing it out in the freshwater in the coming months to prove this theory. The next item to test was the Okuma EVx rod paired with my Revo S. I must say that I was pleasantly surprised with the feel and performance of this rod in the brief time I used it on the water. I was using a 4" soft plastic swimbait tied on with a 15lb. leader matched up to 20lb. braided line. The rod itself is a 6'6" Medium Heavy power rod with a Fast action. It is well made and uses quality components - IM8 blank, Fuji ACS reel seat, stainless steel guide frames with zirconium inserts for braided line to name a few. I was able to feel the subtle thumping of the paddle tail on the swimbait even in the current. While I am not the most precise caster on the water, I was able to cast this rod and place my lure in the spot I wanted with little to no effort at all. This rod will most likely end up being a freshwater rod for soft plastics and frogs, but it was comforting to know that I could take this rod setup as a backup on some of my future saltwater outings for Summer Flounder, Spadefish and slot Redfish. The last piece of equipment to be tested was the Calcutta I had purchased used from a fellow kayak angler. I have to admit I was a little skeptical at first buying a used reel from someone I had never met before, but I had no problem in years past buying something sight unseen used off of Ebay, how could this be any worse? I purchased the reel at an awesome price and was very anxious to get my hands on it and test it out. When I opened the package last week, I was pleased with my purchase and spooled her up with 65lb. braid and a 30lb. mono leader. I figure this setup would still give me castability but still have enough power in reserve in case I hooked into something bigger. I paired the reel up with my 7'0" St. Croix Mojo Bass MH Fast rod and tied on a 1/2oz lipless crankbait. I set the mechanical clutch and tried out a few short test casts with no backlash. Promising I thought. Let's snap off a couple "KVD-esque" type of casts - no backlash..........a devious smile made its way across my face as I spent the next 15 minutes snapping off cast after cast and nary a backlash to be found. A successful test session I think. I could easily see this rod being my primary sight casting rod in the spring on the Eastern Shore or for heavier jig-n-craw setups in heavy cover in freshwater. I did notice one potential concern with the reel, but I am not 100% certain there is a problem yet. Once every few casts, I would feel a subtle "tick" during the retrieve. At first, it didn't phase me, but I want to make sure that the sensation I felt was not just a poorly tied leader knot catching on the top guide during the retrieve. I may take it to a nearby pond and do some shore casting to test it out again, only next time, I will take an additional length of the 30lb. mono leader and tie a different style knot, as well as a length of smaller diameter leader just in case. Last but not least is the review session of pairing my preferred soft plastic Marsh Works Bayou Thumper with a small 3/16oz. bucktail jig. I already knew that the weight of the jig was too light for normal use; however, I had launched into the end of the ebb tide, which meant the slack tide was in full force after I had relaunched from my initial break. I tied the lure on my current favorite Speckled Trout spinning rod setup (my Diawa Regal XiA 3000 paired to a 7'0" TFO G. Loomis Signature Saltwater Series #4 spinning rod) and started casting away into the slack tide. The lure combo was easily retrieved in a swim jig fashion causing the bucktail to flare out on each pause but still retain the action of the paddle tail the Bayou Thumpers are known for. I ended my day on the water at 9pm, just shy of the flood current beginning. Total time on the water was 5 hours, and I accomplished all of my goals for the trip. I left with the confidence that my review sessions and recon techniques for performance further validated the gear choices I had made not long ago. I am already anticipating the next opportunity to get back out on the water with these combos and chase some fish for real. I also left knowing that my flush mount installation was the right location and will significantly increase my visibility on the water and add to my overall safety-oriented profile. Until next time folks, be safe, be smart and most of all share your time on the water - whether it is with a family member, a friend, a kid or even better a veteran or current service member - get out and enjoy one of the most important natural resources we have on this planet.